MANILA — Filipino activists called on the Mexican government to immediately investigate the brutal killing of Mexican activist Gustavo Salgado Delgado. The Mexican activist was abducted by state security forces last Feb. 3. His remains, decapitated and bore signs of torture, were found the following day in Morelos, Mexico. He was long to have been subjected to harassment, threats and repeated illegal arrests, said the human rights group Karapatan. Elmer Labog, chairperson of the International League of Peoples’ Struggles – Philippines (ILPS-Philippines), likened the brutal killing to that of labor leader Rolando Olalia, and activist Leonardo Alay-ay who were abducted and killed by the military in 1986. 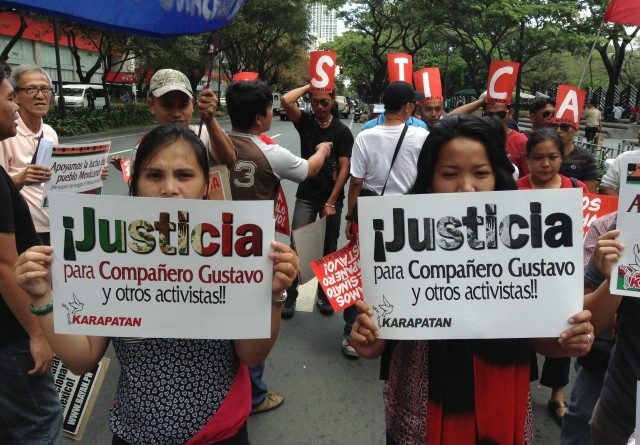 “We demand justice not just for Gustavo but all those who were killed,” Labog said. Such desecration of Delgado’s remains is meant to scare the people from their struggle, said Roger Soluta, secretary general of Kilusang Mayo Uno (KMU). Delgado was a leader of progressive group Frente Popular Revolucionario de Mexico (FPR) and a member of the ILPS. “Too young,” Rita Baua of Bagong Alyansang Makabayan (Bayan) noted. Activists belonging to progressive groups Bayan, KMU, Migrante International, Bayan Muna, and various peasant, women and youth groups marched on the streets of Makati City, the country’s financial district, and held a protest action in front of the Mexican embassy. In a statement, Bayan said Delgado was a member of the National Executive of the FPR. Part of his tasks, they added, was to organize people in various districts such as Queretari, San Luis Potosi, Veracruz, Guerrero, among others. He was also vocal about the workers’ plight, and active in the struggles of workers in the Local Councils, the Mexican State Media, and the Mexican Electrical Workers, who were laid off in 2009, said Bayan. Delgado was also a critic in the infamous disappearance of 43 students in Mexico, on suspicion that it was perpetrated by the government. Bayan said the most recent campaign that Delgado took part in before he was killed was organizing indigenous peoples and agricultural workers who were displaced by a typhoon. Throughout a major part of his life, Delgado was involved in “organizing vulnerable groups,” Bayan said. Bayan paid tribute not just to the slain Mexican leader but also to FPR, “for its commitment to continue the struggle of Gustavo” and to carry on the task of building a society with a socialist perspective. “Even here in the Philippines, those who organize the ranks of peasants are either being harassed or killed. They only want to mobilize the people to uplift their lives,” Zen Soriano, chairperson of women peasant group Amihan, said. At the program, the protesters said the social, economic and political conditions in Mexico are similar to the Philippines. “Mexico is the third biggest country that benefits from remittances. The Philippines come as fourth. And yet, just like in the Philippines, people there live in dire conditions,” said Garry Martinez, chairperson of Migrante International. Martinez visited several cities in Mexico in 2010 for the International Assembly of Migrants and Refugees. During his stay, he added, he was able to march the streets and talk with migrant workers and even peasants who were victims of landgrabbing – a scenario, he said, that is present in the country. Labog, for his part, described Mexican president Enrique Peña Nieta as one of the most subservient presidents to the United States, adding that he has carried out many anti-people policies that led to the increase of prices of goods and utilities. “The time will come that both Mexico and Philippines would be free of imperialist control,” Martinez said. Cristina Palabay, secretary general of Karapatan, lamented that Delgado was a “loss” and was a staunch human rights defender. His killing, however, was only qualified as mere homicide by Mexican authorities. Palabay added that the family Delgado left behind was denied access to government documents on the investigation. They are also currently being harassed and intimidated by state security forces, she said. Meanwhile, in a letter submitted to Mexican ambassador to the Philippines Julio Camarena Villaseñor, KMU put to task its government to ensure that justice would be served.